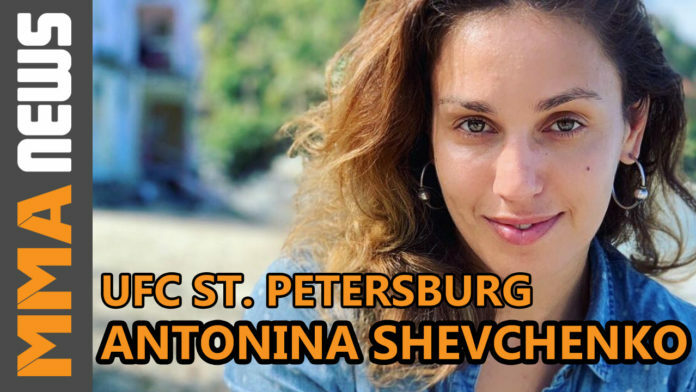 Antonina Shevchenko looks to continue her winning ways. Following a dominant win over Jaimee Nievera at Dana White’s Tuesday Night Contender Series in July, Shevchenko followed that up with a victory in her UFC debut over Ji Yeon Kim at The Ultimate Fighter 28 Finale. It was a successful year for the Shevchenko sisters, as Valentina captured the UFC’s flyweight title a few months later, with a win over former strawweight champion Joanna Jedrzejczyk at UFC 231. Shevchenko (7-0) now puts her undefeated record on the line against TUF 26 finalist Roxanne Modafferi at UFC Saint Petersburg on April 20. Because of the long distance travelling to Russia for this fight, the 34-year-old opted to train in Thailand at Tiger Muay Thai for this matchup instead of in the United States. With her first UFC victory out of the way, Shevchenko now looks for her first stoppage win in the octagon. The Muay Thai standout and her opponent Modaferri have put it out there on social media that this fight won’t go to the judges’ scorecards. UFC on ESPN+ 7 takes place at Yubileyny Sports Palace in St. Petersburg, Russia. The main event pits Alexander Volkov against Alistair Overeem in a heavyweight fight.